When it comes to customer mailers, competition is fierce. Using Xerox color paper can help! 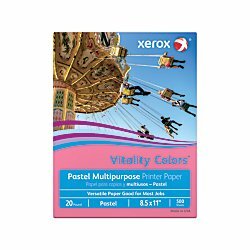 Use this Xerox paper to create documents, pamphlets, brochures and more that help your brand stand out. Colored printer paper in soothing hues set documents apart. Xerox multipurpose paper is great for drawing attention to bulletins and brochures, highlighting sections of reports, color-coding documents and more. This 20-lb recycled printer paper is ideal for everyday use. Xerox paper is great for 2-sided printing. This color copy paper resists ink show-through, so your work remains neat and legible. Acid-free means archived documents last longer. Greener choice - paper contains a minimum of 30 postconsumer recycled content. View More In Brochure Paper.